WhatsApp also encourages users to be mindful while sharing messages on the platform. Other than this feature, the company also provides options to either report spam or block a particular contact from their list. 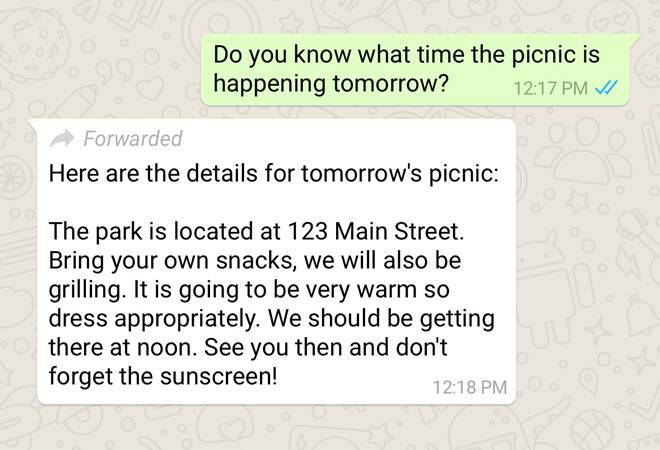 "Starting today, WhatsApp will indicate which messages you receive have been forwarded to you. This extra context will help make one-on-one and group chats easier to follow. It also helps you determine if your friend or relative wrote the message they sent or if it originally came from someone else," stated the blog. There are various methods by which WhatsApp is trying to deal with the crisis of fake forwards in India. Recently, the instant messaging application launched something called 'Admins Only' control in WhatsApp groups. This feature allows group admins to restrict messages from other participants. This broadcasting feature allows a synchronised flow of information. The company even published 10-point guidelines on most national newspapers across the country. These guidelines will also feature on most regional dailies as well.